The Polio Eradication initiative is a public-private partnership led by the Government of Pakistan, spearheaded by the Word Health Organization (WHO), Rotary International (RI), the United States Centers for Disease Control and Prevention (CDC), Islamic Development Bank (IDB), and the United Nations Children’s Fund (UNICEF) program with an aim to eradicate Polio from Pakistan. Webmekanics, an emerging Web Design Company feels very proud to be the official designers and developer of End Polio Pakistan website. The websites was designed using the latest Web Design tools keeping in mind the nature of the website along with the data that was to be populated on it. The Creative Team at Webmekanics did their best in coming up with a number of designs which made it easier for the client to choose from. 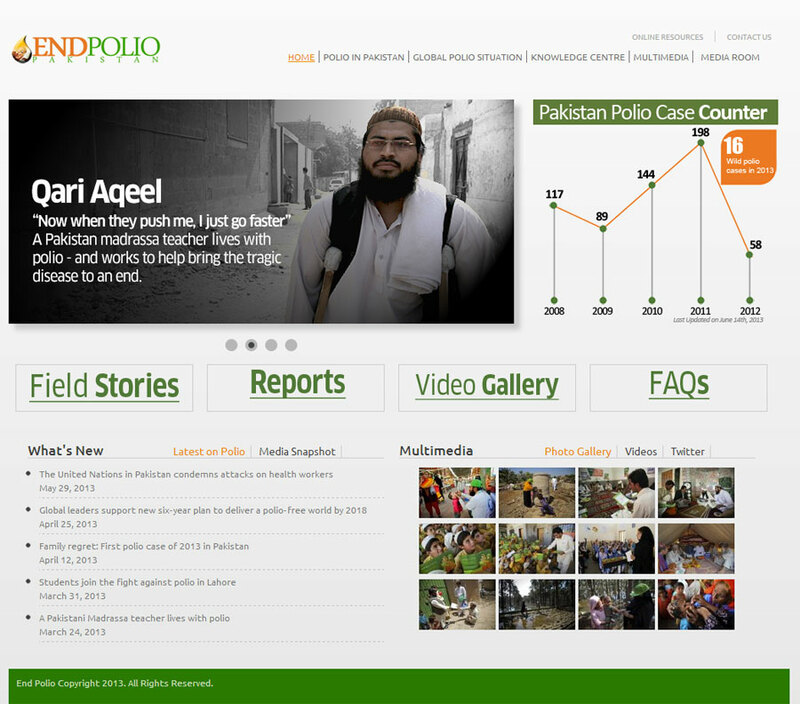 The current design includes a full featured media gallery, including pictures and videos, an articles section which includes content from around the globe which in any way relate to the global Polio Eradication campaigns, and Frequently Asked Questions (FAQs) and Reporting sections. Webmekanics feels honored to work for such prestigious clients and hopes that with all these efforts being made by Pakistanis and the global community, soon Insha’Allah Pakistan would be declared a Polio Free country.